It seemed on the surface like I had it all; great husband, beautiful children, fabulous house and close friends…yet I felt so empty, alone and sad. I was so frustrated but couldn’t figure out why. Once I found great mentors to help me, I could identify WHY I felt the way I did and heal all the subconscious limiting beliefs that were holding me back from simply being happy! After years of personal work and study, in 2004 I decided to help others do the same. Since then I have been in private practice helping people release their blocks and find their highest potential to live the life of their dreams. I originally called my business Lucid Insight because that is what I offer, some serious “Aha!” moments! I am always engaging in my own journey to take myself up to the highest vibration and learn new modalities that I can integrate into the work I already do. As an online Spiritual Coach I can help more people break free from the chrysalis of their fear to find deep happiness, self-fulfilment and freedom. The more people I can help do this, the faster I will have an impact on raising the consciousness and vibration of our beautiful Pachamama (Mother Earth). In Peruvian philosophy the snake represents the Underworld (Uhupacha) and symbolises letting go of the past so we don’t have to fight all the time. Just as the serpent sheds its skin all in one piece, we want to leave the past behind so we can be free to live in joy right here and now. 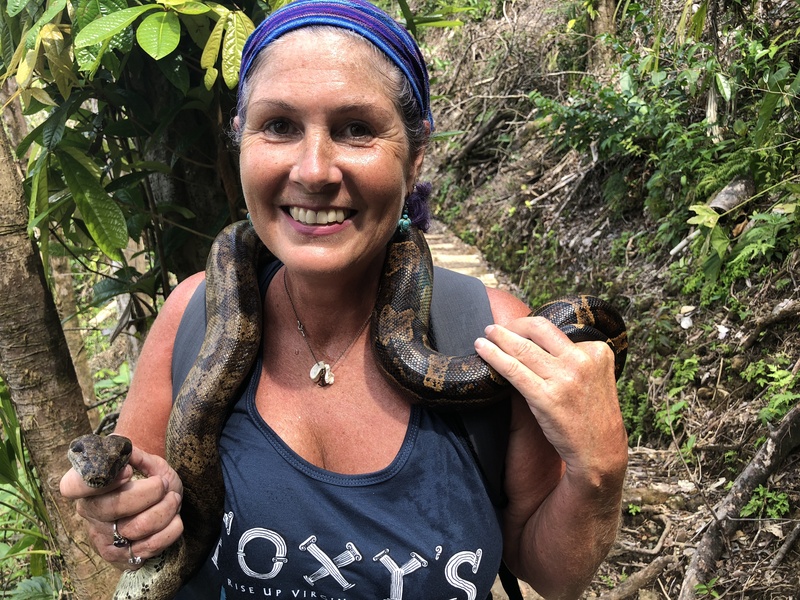 I have many power animals, but I was blessed to be greeted with this baby boa on the path in Domenica. I think it is illuminating to pay attention to the signs and symbols from the universe and to embrace cultural diversity. Shannon was born and raised in New York and Argentina. She relocated to the UK in 1988 and raised her two sons in Yorkshire. She has also lived in Spain and Gozo. She has a background in drama and dance and loves to sing and laugh! Shannon considers herself a citizen of the world and travels whenever she can. Fluent in Spanish, her heart path is Incan Shamanism and she is a full mesa carrier. Shannon has been very blessed to study with so many Master Teachers. She has studied Transactional Analysis, Hypnotherapy, NLP, Transpersonal Psychology, Shamanism, Theta Healing and Eden Energy Medicine (please see FAQ’s for further info). She is an avid reader, writes poetry, and is most fascinated by people’s relationships with themselves, shifting energy and helping people transcend their limitations. She currently lives in the UK with her purring familiar, Bliss.